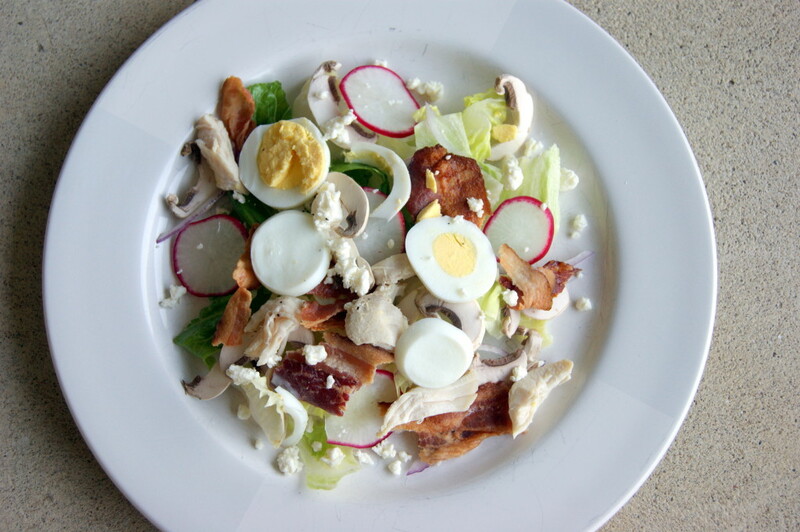 A deliciously fresh salad that can be eaten for lunch or a light dinner on a hot summer day! 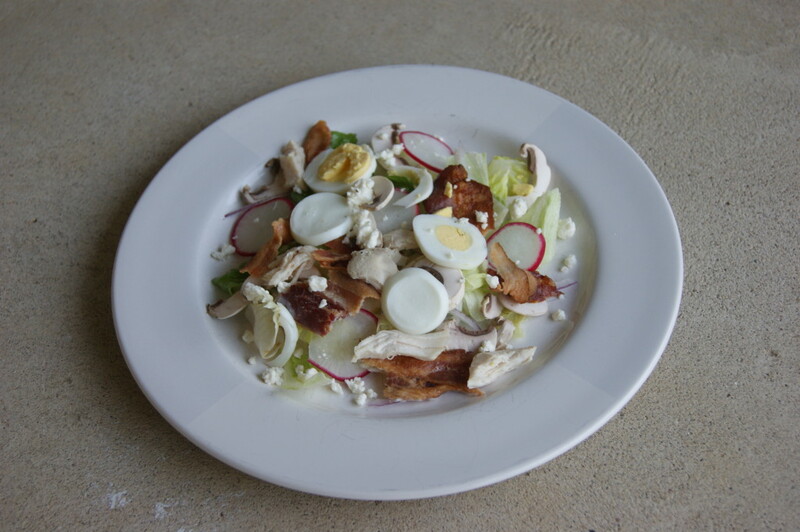 It’s my twist on a cobb salad without a heavy, creamy dressing. Instead, I tossed the salad with equal parts extra virgin olive oil and red wine vinegar. The hit of acid provided by the vinegar is the perfect complement to all of the rich and tasty ingredients. 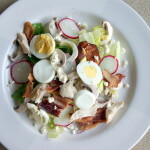 A creamy dressing would just overpower all those yummy nuggets! Serve this on its own for lunch or with a crusty baguette or even better with this Cheesy Garlic Bread for dinner! Place chicken breast in a medium pot, add bay leaf, garlic, peppercorns and salt. Cover with water and poach over medium heat for 15 – 18 minutes until chicken is cooked throughout. Remove from heat and let chicken cool at least 10 minutes, before shredding into bite-size pieces. 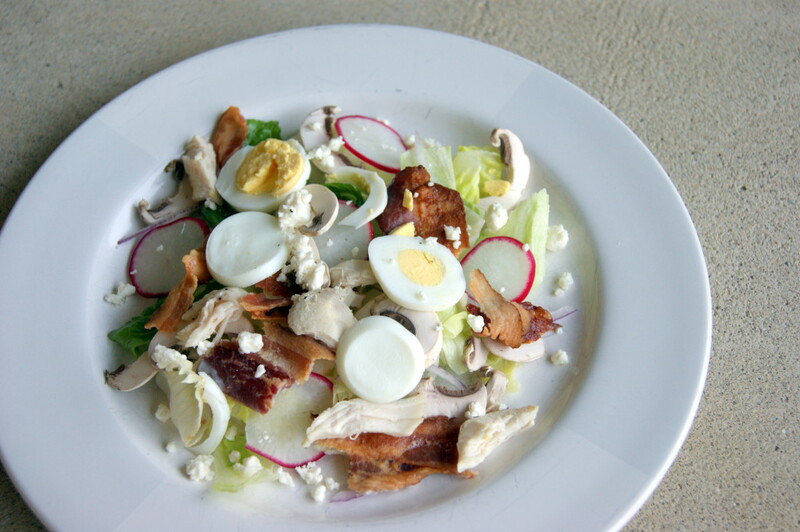 Toss lettuce in a large bowl with bacon, mushrooms, eggs, radishes, cheese and red onions. Drizzle olive oil and vinegar over salad. Toss salad until well coated.